For me it was the best chose in Phnom Penh. I felt Velkommen from the first moment. Everything was perfect: safe, clean, central but not noisy. Staff was lovely. The room was really big , the bed very comfortable and everything was in a good condition-especially the water pressure! For them who think they'll get a 4 *room for 15 $: pay more and you'll get it! Special thank to Edvin- he organized my further Journey perfect. 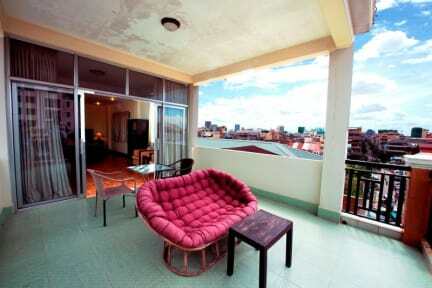 Whenever I'll come back to Phnom Phen - I know where to stay. It's a nice stay, but no Hotel-Keep that in mind and you'll enjoy the nice and friendly staff. When we arrived very late but the reception was still there. The staff was very friendly and offered us everything we want to have a pleasant stay. Sehr enges Zimmer für zwei Personen. Jedoch ist das Bad sehr sauber und es hat eine gute Lage. Zimmer sind Hinterhofzimmer. Die vorhandenen "Fenster" bringen kein Licht und sind direkt vor der nächsten Hauswand, wo Tauben sitzen. Ungemütliche Zimmer. Das Bild vom Rooftop war ein extra Zimmer was man mieten konnte, jetzt aber nicht mehr zur Verfügung steht. Zimmer waren sauber. Gemeinschaftsbereich hätte sauberer sein können. Mitarbeiter waren sehr nett und hilfsbereit. Preis-Leistungsverhältnis geht besser. The walls of our room had been full of mold spots. The toilet in our bathroom released strange bubbles, such that you smelled urine. Might be okay for 1 night. The staff was friendly!